South Africa's "First Lady of Pinotage"
Award-winning winemaker Debbie Thompson leads the red-wine team at Simonsig. 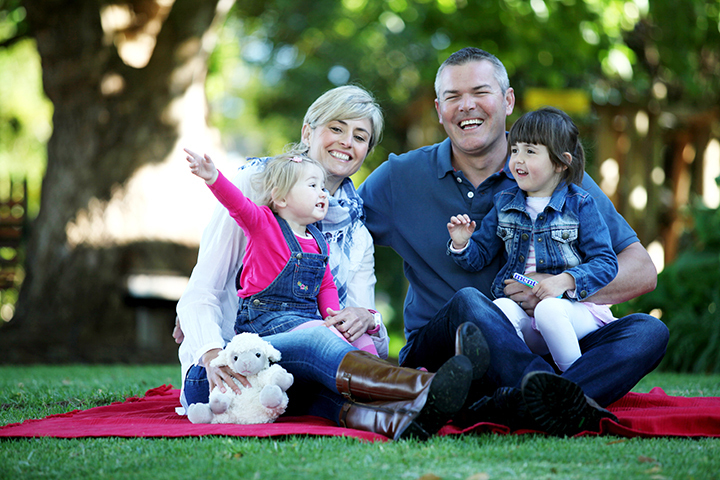 Debbie Thompson, husband Simon Thompson with their daughters Hannah and Jessie. It's "all hands on deck" as Simonsig winemakers Debbie Thompson and Hannes Meyer (at right) help with harvest. Debbie is one of South African’s top winemakers, leading the red-wine team at Simonsig, the bucolic vineyards and wine estate in the shadow of the Simonberg Mountains where award-winning wines have been made since the early 1960s. Owned by the Malan brothers, they are descendants of a family of French Huguenots who have been farming the region since the late 1600s. In 2014, Debbie won the ABSA Top 10 Pinotage Award for a sixth time, a remarkable achievement in South Africa’s leading wine competition committed to annually selecting the country’s top 10 Pinotage wines. 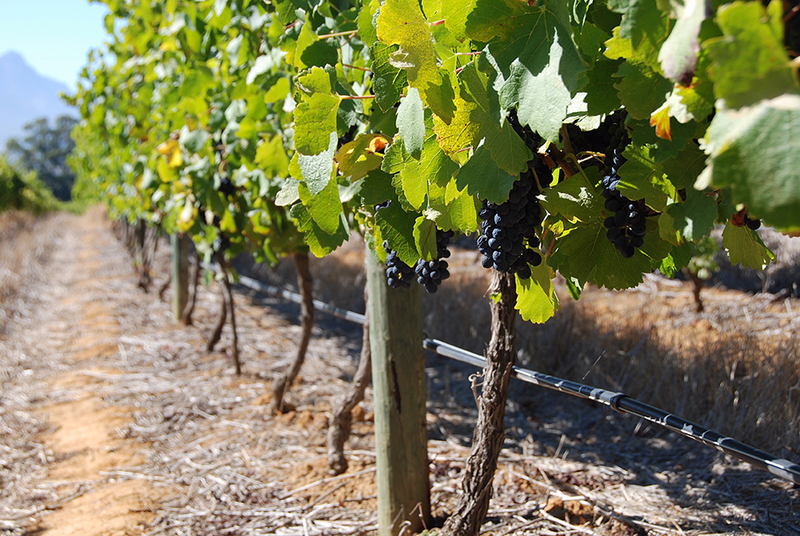 Pinotage is a red wine created by a hybrid grape, made from the French varieties Pinot Noir and Cinsault, that grows only in South Africa. In 2005, Debbie was named “South African Woman Winemaker of the Year,” and she has earned the nickname “South Africa’s First Lady of Pinotage.” But, winemaking was not her first career choice. Debbie hails from the dry Namaqualand region in the northwestern part of South Africa. She was born in a small diamond mining town where her father was a mine foreman. He died of a heart attack at the age of 43, and her mother moved the family away from the mine. They had a family sheep farm, but her mother did not want to live there as it would mean sending Debbie and her two brothers to a boarding school. So they ended up living in the town of Springbok, just south of the border between South Africa and Namibia. Initially, Debbie planned to study veterinary science, but that meant going to the interior city of Pretoria. All her friends were headed for the University of Stellenbosch, so, following them, she enrolled there to pursue a bachelor of science degree. “And then the wine bug bit,” she explains. “Here you are at Stellenbosch in the Cape Winelands. You start going out to parties, and you’re exposed to some amazing wines. As my interest in wine grew, I thought I might as well extend my science degree to the viticulture and oenology degree that the University offers. Simon loves cooking, so while he’s behind the stove, Debbie selects the wine. If Simon is preparing the famous South African bobotie, a curried meat casserole that is a cross between British shepard’s pie and Middle Eastern couscous, Debbie will pick one of the Simonsig Pinotages that Debbie has become famous for. While it is not aged in oak, the Simonig Pinotage has earthy and almost smoky flavors that would lead one to believe that it spends some months in French or Slovenian oak. 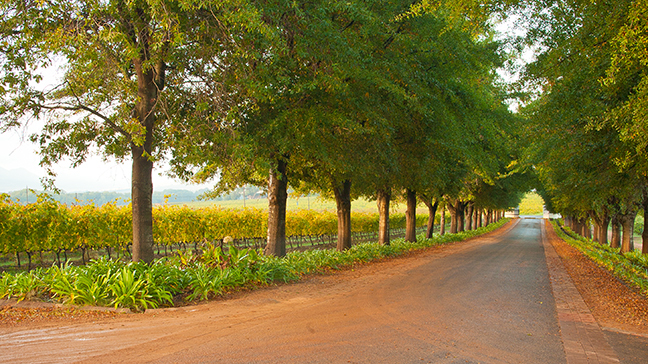 In fact, it is the terroir of South Africa that accounts for its characteristics. Debbie calls it a “masculine wine…and a genuine South African variety” of which she is very proud and happy to be making what is considered in South Africa, and here in the United States, the best representation of this variety. She also makes a wooded version called Redhill Pinotage and is responsible for the wineries’ other red wines, including red blends Tiara and Frans Malan (named after the father of the three brothers currently running the winery, he helped usher Simonsig and Stellenbosch into the “modern wine” era in the 1960s). Debbie believes that making wine is all about balance and that is the same philosophy she follows in her life with her husband and children, balancing her rewarding career with the demands of family -- much the same as many other first ladies.